We take a closer look at Top of the Rock, its impact on local tourism and the man who built it all: Johnny Morris. 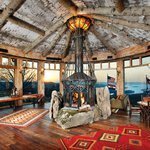 Get to know Johnny, the founder of Bass Pro Shops, Big Cedar Lodge, Dogwood Canyon Nature Park, Top of the Rock and more. 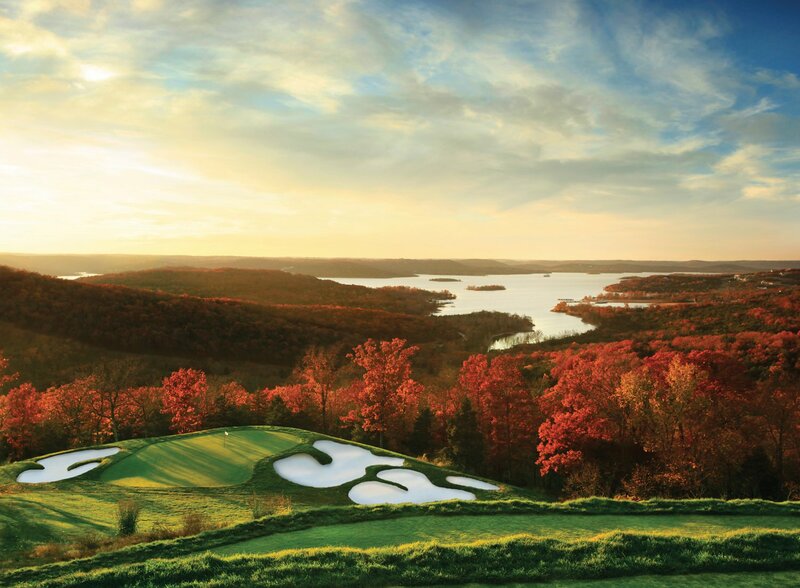 Photo courtesy Top of the RockAlong with countless beautiful views of Table Rock Lake, Top of the Rock features a Jack Nicklaus signature golf course, an Arnold Palmer Driving Range and a Tom Watson Himalayan Putting Green. There's a sense of sincerity in Johnny Morris's voice as he tells his story of falling in love with the Ozarks and its rich history. Fast forward five decades, and now Johnny is the owner of Bass Pro Shops, Tracker Boats, Big Cedar Lodge, Integrity Hills, Dogwood Canyon Nature Park and—his most recent creation—Top of the Rock. All of them have not only enriched the lives of 417-landers but also played a huge part in bringing state- and nation-wide tourists to southwest Missouri. And although his outdoorsy empire has flourished since that spring day some 50 years ago, not much about Johnny has changed. This guy is truly fueled by sharing his love of the outdoors and telling the story of what life was like long ago. 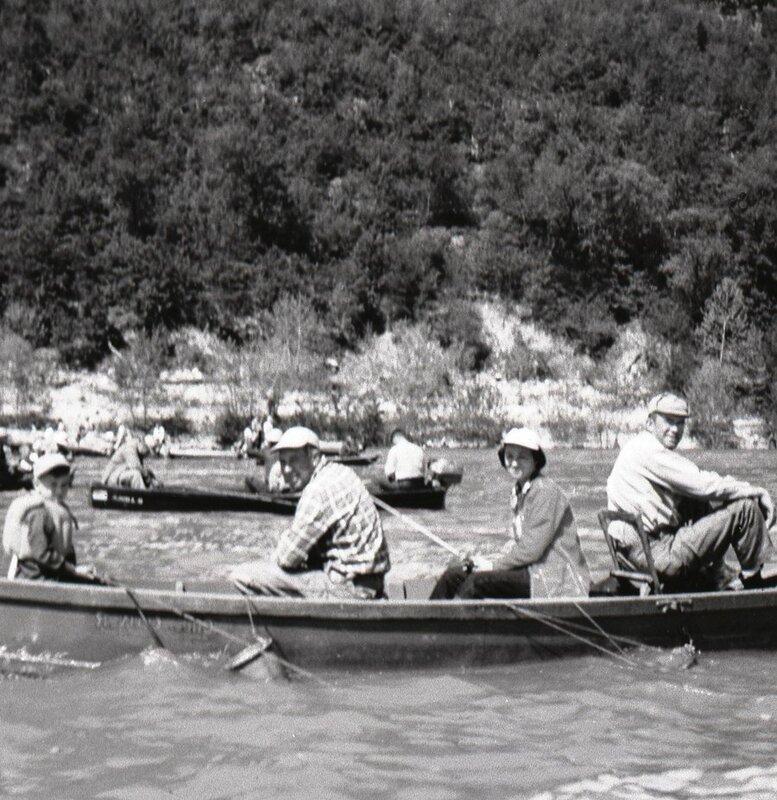 Photos courtesy of Johnny Morris Left: Johnny Morris (far left) fishes on the White River with his father, his mother and his Uncle Charles. Some of Johnny’s most- treasured memories include family fishing trips he enjoyed during his childhood years. 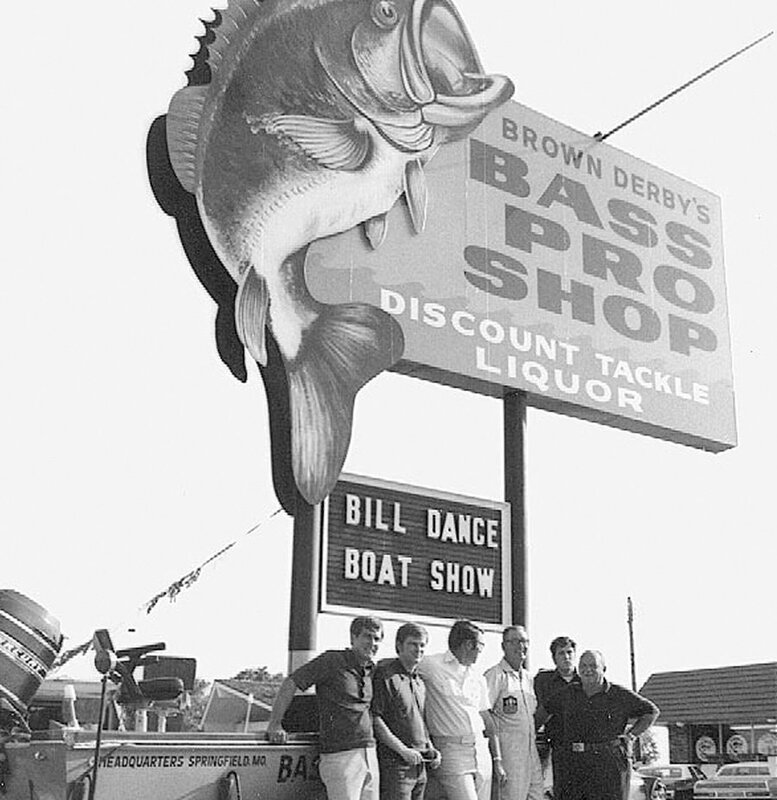 Right: In 1972, Johnny Morris (far left) began selling tackle in the back of his father’s Brown Derby liquor store. The tackle became a popular attraction, and Bass Pro Shops was born. What is now an outdoor enthusiast’s dream on the shores of Table Rock Lake began with a simple passion for fishing. Johnny has been fishing in 417-land waterways since he was a child. “When I was about 10 years old, I went to the opening of Table Rock Dam with my grandfather,” Johnny says. “We watched the first water come up over the dam. It really changed the habitat for fishing here. A lot of our favorite places on the river went away, but it created a whole new fishery.” As he grew through high school and college, so did his love of the sport. “In 1970, I was going to school at SMS—or I was supposed to be—but I was also fishing a lot,” Johnny says with a laugh. “During the first national B.A.S.S. [Bass Anglers Sportsman Society] tournament, I met fishermen from all over the country. I knew when I went to that tournament that all I wanted to do was fish or be around fishing.” This inspired Johnny to rent a U-Haul trailer, travel across the country and fill it with the newest and most exceptional fishing tackle he could find. When he returned to Springfield, he started selling the tackle out of his dad’s Brown Derby Liquor Store. It was a hit, becoming popular for anglers who visited on their way to 417-land lakes, and they began calling Johnny even after they returned home to ask him to send them some of his specialized gear. To feed the growing demand, the first Bass Pro Shops catalog was created in 1974. And in 1978, the same year he turned 30, Johnny created and sold Bass Tracker, the industry’s first fully accessorized, ready-to-fish boat, motor and trailer package. Photo courtesy of Johnny Morris, photo by Jessica Kennon Spencer Left: Johnny Morris, who has enjoyed fishing since he was a little boy, started fishing in tournaments during his college years. Today, fishing is still one of his favorite pastimes. Right: Johnny first met his wife, Jeanie (above), in 1982. “I try as best as I can to keep things calm and comfortable for him, because his life is busy and can be crazy at times,” Jeanie says. Photo courtesy of Big Cedar LodgeA few years after he began selling Tracker Boats, Johnny Morris decided he wanted to offer his customers a place to put their boats on the water. He began searching for properties on Table Rock Lake, and he made a purchase in 1987. 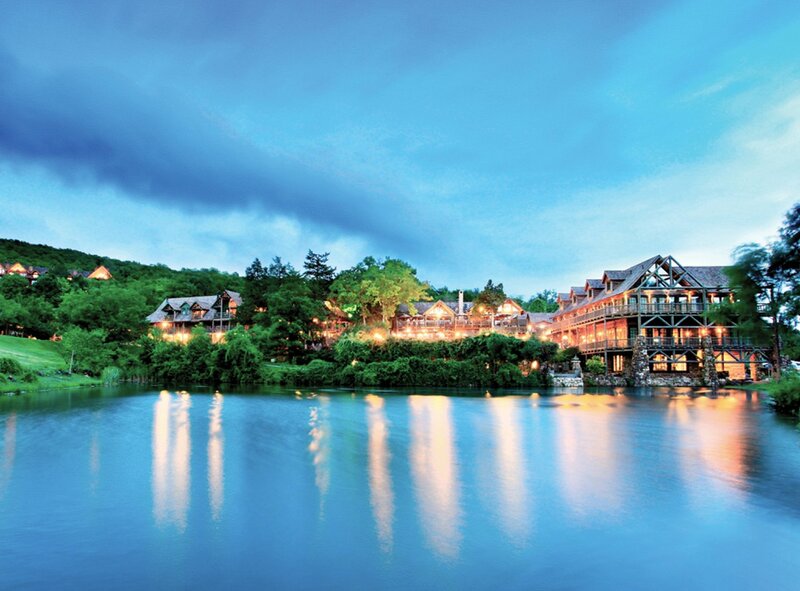 After the purchase, Johnny changed his plans of hosting boats and created Big Cedar Lodge, which is now a first-class resort that attracts tourists from all across the country. Tracker Marine Group, which manufactures and sells a variety of boats for fishing and cruising, has produced the No. 1 selling brand of fishing boats for more than 36 years. But long before Tracker Boats became so popular, and just a few years after he began selling them, Johnny decided it would be nice to let customers try out their new purchases. “He said, ‘Well, these people are all coming to Springfield to pick up their boats, and I’d love to have a place to host them, so they could put their boats in the water,’” Jeanie says. He began to search for properties on nearby Table Rock Lake. “One Sunday, he said he was going down to the lake for a land auction,” Jeanie says. In the meantime, she noticed an ad in the newspaper for a piece of land nearby. “I called him and told him about it, so he could see it while he was there,” she says. The auction deal didn’t work out, but Johnny fell in love with the property Jeanie had found. “He called me up and said, ‘Hon, I love that place you found!,’” Jeanie says. “Then he took me out there, and I thought, ‘Oh goodness. What did I do? This is in the middle of nowhere, and every building has a different architecture.’” Not sure why Johnny was so intrigued by the land, Jeanie asked him what they’d do to it. “He said, ‘Oh, just some fresh paint and new TVs,’” Jeanie says. They bought the place, and it has since evolved into Big Cedar Lodge. 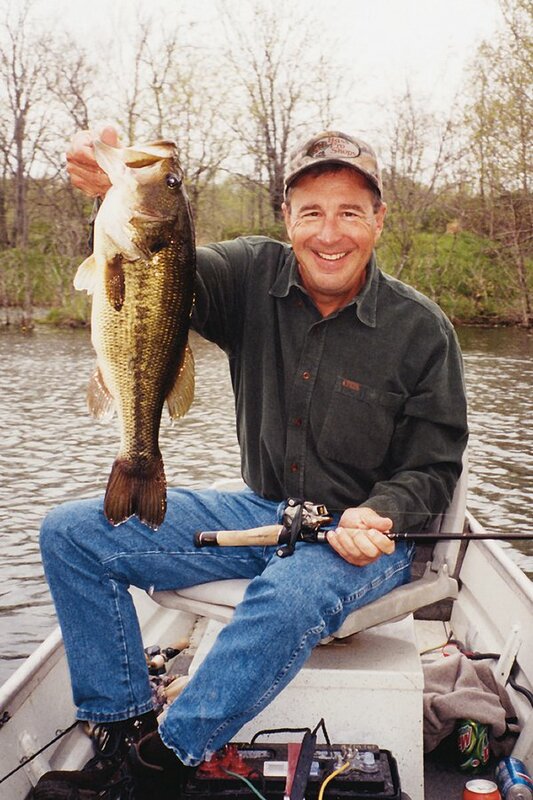 After purchasing the Big Cedar Lodge property in 1987, Johnny was inspired by the beauty of Table Rock Lake and his own childhood memories of family fishing trips, so he forfeited his plans of being a fishing host and instead created a place for families to reconnect with nature. 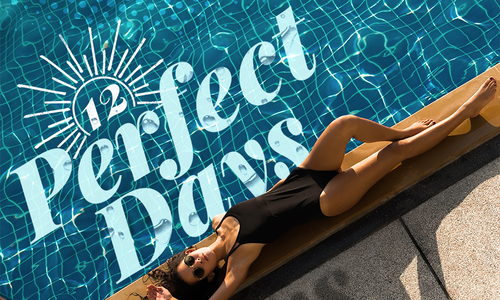 Today, Big Cedar is fully equipped for families with first-class rooms, cabins and lodges, fine dining restaurants, spa services, swimming pools, golf courses and, of course, an unbeatable lake-front setting. And it has gained quite the reputation over the years, being named one of the world’s best family hotels in the company of big names such as Ritz-Carlton, Disney, Four Seasons and more by Travel + Leisure. It has also been recognized as the No. 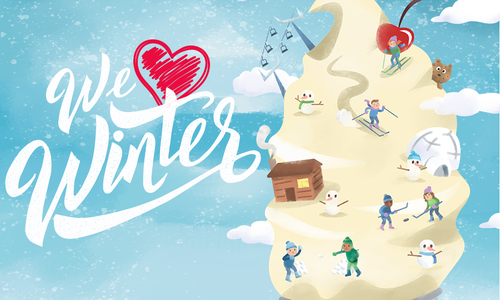 2 Top Resort in the Midwest by Conde Nast Traveler, the Best of the Best by The Wall Street Journal and one of the Top 10 Resorts in the Country by Southern Living, among other accolades. 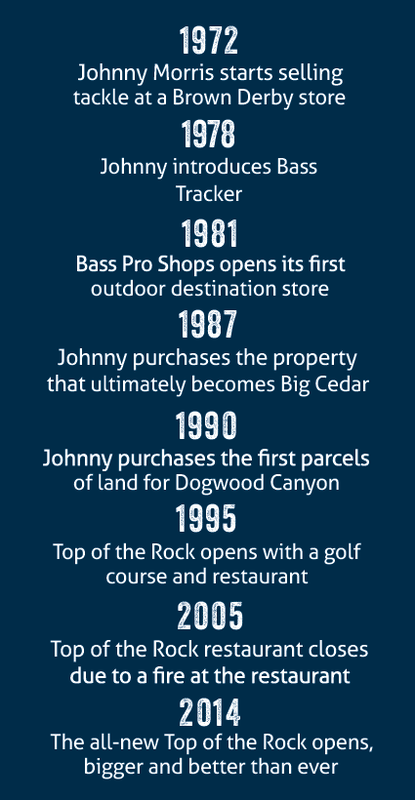 In 1990, Johnny continued to expand his resume of properties when he acquired the first parcels of the land that are now Dogwood Canyon Nature Park. 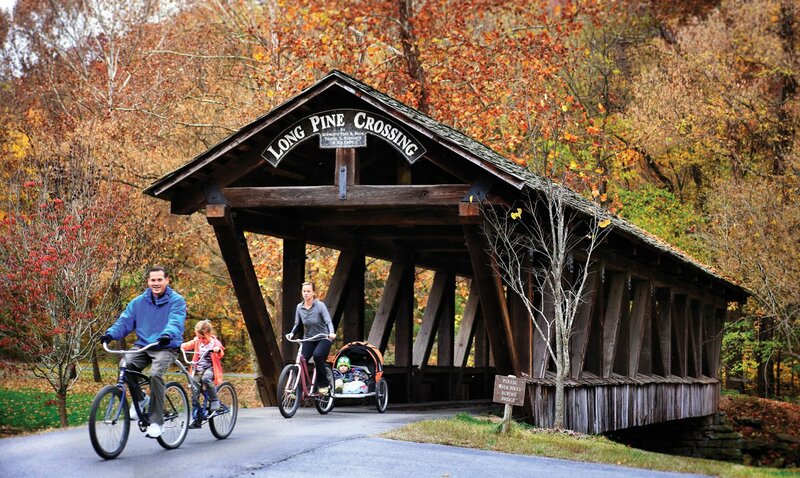 Located in Lampe, Dogwood Canyon is a 10,000-acre park that attracts local and national visitors to 417-land by offering hiking, biking, trout fishing, 3D archery, tours and more. “I wanted to create a nature park where I could bring back some buffalo and elk that were native to the area and also have a place for people to fish and hike,” Johnny says. Photo courtesy of Dogwood CanyonOffering trails great for both hiking and biking, Dogwood Canyon Nature Park is a popular spot for family outings. 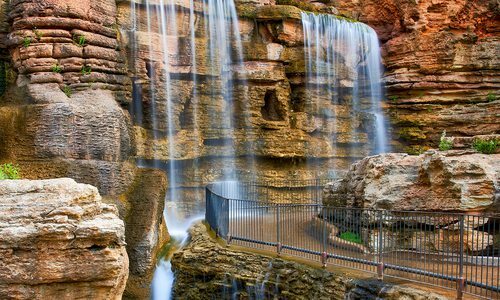 When you lump Dogwood Canyon with Big Cedar Lodge and Johnny’s newest property, Top of the Rock, the three greatly contribute to southwest Missouri’s tourism and, in turn, economic health. 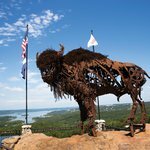 “These three destinations help shine a spotlight on southwest Missouri and the natural beauty of the Ozarks,” says Missouri Division of Tourism Director Katie Steele Danner. After purchasing the property, Johnny asked Jeanie what she would like to do with it. “He asked me, ‘Hon, do you want to live there, or do you want to make it a restaurant,’” Jeanie says. 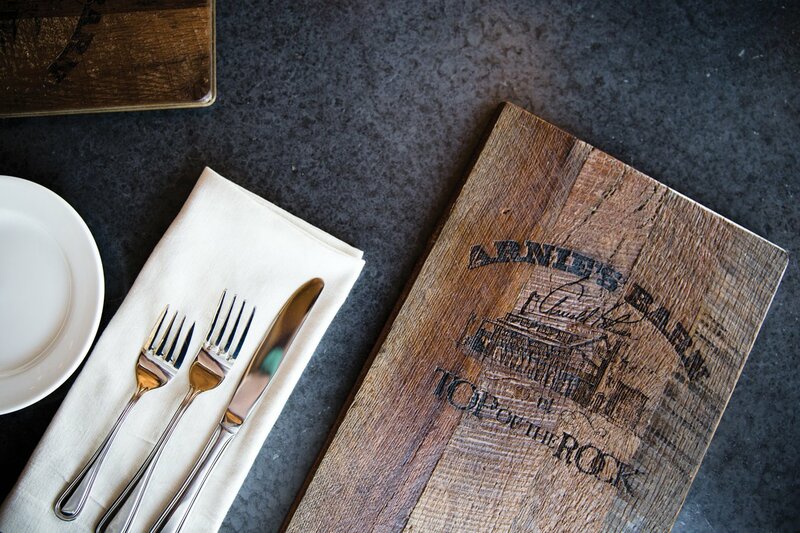 “We have four kids, and they were all in school at Springfield at the time, so I said, ‘Let’s make it a restaurant.’” Then in 1995, the original Top of the Rock was born, offering 417-landers fine dining with a side of world-class views. But there was a fire at the restaurant in June 2005, and Top of the Rock closed. For the following several years, the restaurant’s plans to reopen were rather hush hush. “People would say, ‘What the heck is taking so long to open that restaurant after a pizza fire?’” Johnny says. 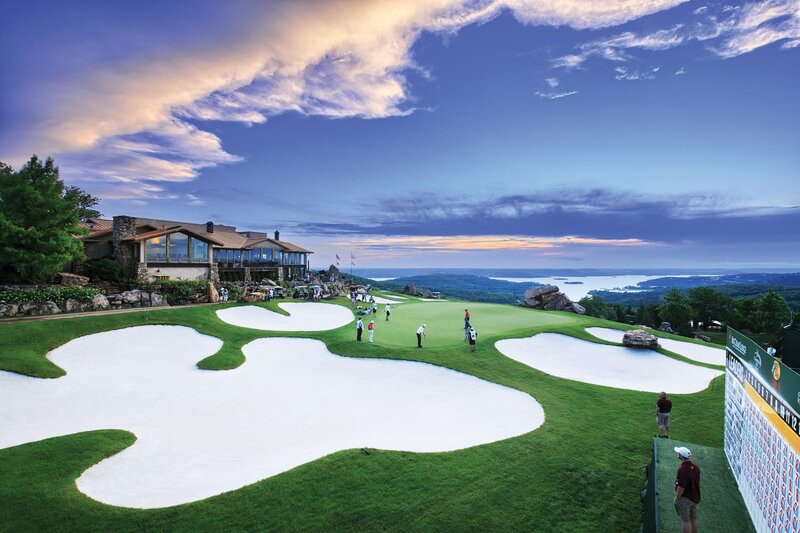 Photo courtesy Top of the RockTop of the Rock was the first-ever par-3 course to be included in an official PGA Tour tournament when it hosted the Big Cedar Lodge Legends of Golf presented by Bass Pro Shops. 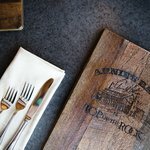 After much anticipation and speculation from 417-landers, Johnny Morris’ Top of the Rock Ozarks Heritage Preserve reopened in June 2014, and it became obvious what took so long: What used to be a single restaurant is now an entire 462-acre property with four restaurants, a 2.5-mile nature trail and cave, a golf course designed by Jack Nicklaus, a practice course designed by Arnold Palmer, a Himalayan putting green designed by Tom Watson, a natural history museum, an all-American wine cellar, a chapel, a cabin and countless jaw-dropping views of Table Rock Lake and the surrounding landscape. And while this landscape could be considered the star of the show, each and every building of Top of the Rock competes. Everything was created with much thought and attention to detail. Every single beam on the property was carefully hung, and each and every one of the thousands of stones was placed with the utmost care. Everything is precisely manicured, and it all goes together to create a truly picture-perfect masterpiece. It all just seems to belong, exactly as it is. 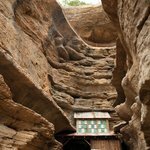 Wait, there’s an actual bar inside of a cave? Yes! This fun little spot offers guests the chance to grab a quick, refreshing cave concoction before continuing on the rest of the 2.5-mile trail that weaves its way through beautiful Ozarks landscape. The menu is filled with tasty treats like John L’s lemonade and Bat’s Blood (a version of a bloody Mary). Perhaps the most striking visual at Top of the Rock is the recreation of James Earle Fraser’s “End of the Trail” sculpture. (The original sculpture is located in the National Cowboy Museum.) Standing proud in Top of the Rock’s infinity pool, this recreation features an Indian who is slumped upon his tired horse, signifying the weariness the Native Americans felt after much battling led to the forfeit of their land. The sculpture you can see there now is just a place holder—a bronze sculpture is being made. Perfect for hanging out before or after an evening meal, a gorgeous stone-lined stairwell leads from Buffalo Bar Restaurant to the End of the Trail All-American Wine Cellar below. 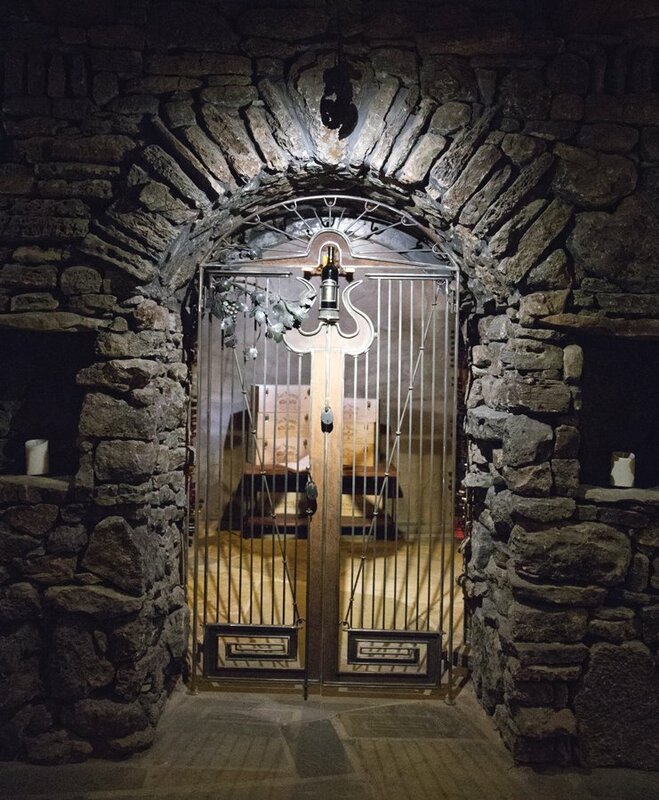 Filled with incredible stonework and perfectly placed windows, this pleasant yet almost cave-like area is truly breathtaking. 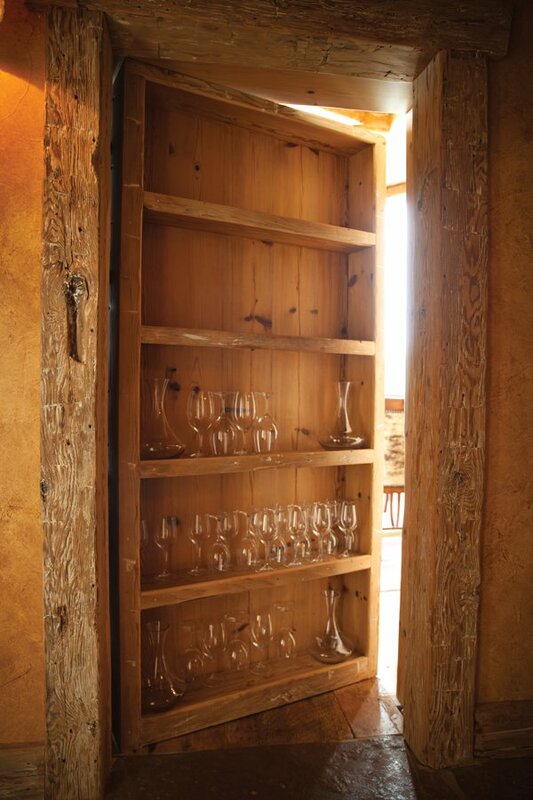 More than 200 varieties of American wines fill the wine cellar rooms, which sit behind locally crafted iron gates. 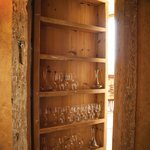 Spaces in the cellar include a wine tasting bar, a whiskey room and a cigar and cognac room and a banquet space. 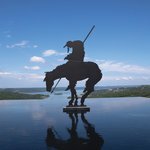 The spot is beautified with Amish hand-hewn beams and glass doors that open to the infinity-edge pool that appears to flow into Table Rock Lake. 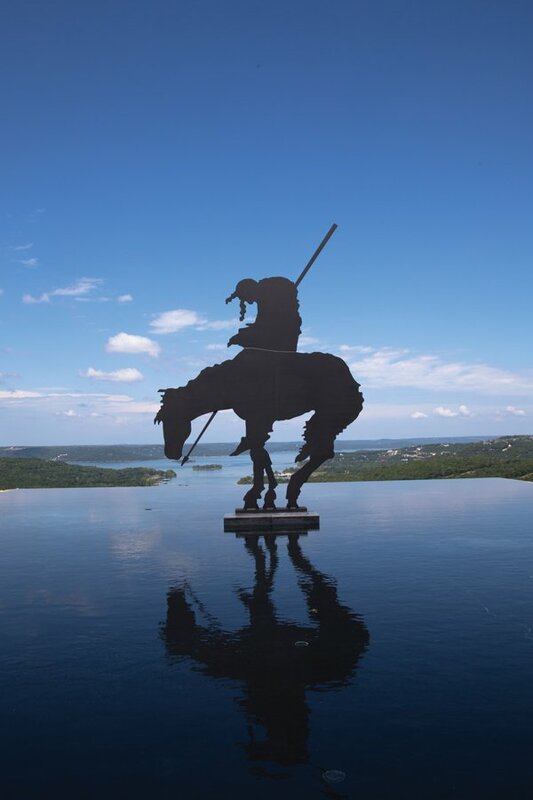 The pool features the “End of the Trail” bronze statue, which is where the wine cellar gets its name. 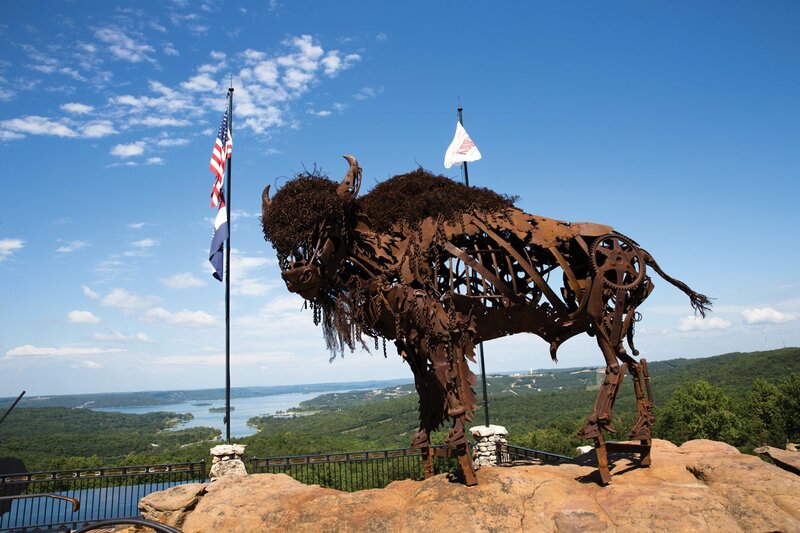 The Ancient Ozarks Natural History Museum at Top of the Rock celebrates the rich ancient history of the Ozarks with a variety of artifacts, including a woolly mammoth skeleton. “One day, Johnny said to me, ‘Hey, hon, look up and see if you can find me a woolly mammoth,’” Jeanie says. “I said ‘No, I can’t find one. 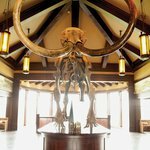 That’s crazy!’ Well, the next day, Debbie Bennett found him a woolly mammoth.” Bennett was the second employee hired to work at Big Cedar Lodge and has worked with Johnny for 28 years. While at a sidewalk art show in Scotsdale, Arizona, Johnny and Jeanie Morris spotted a buffalo created from found rusty objects (above). As they watched passersby and saw the joy the buffalo brought to everyone, they knew they wanted to bring the piece to Top of the Rock. 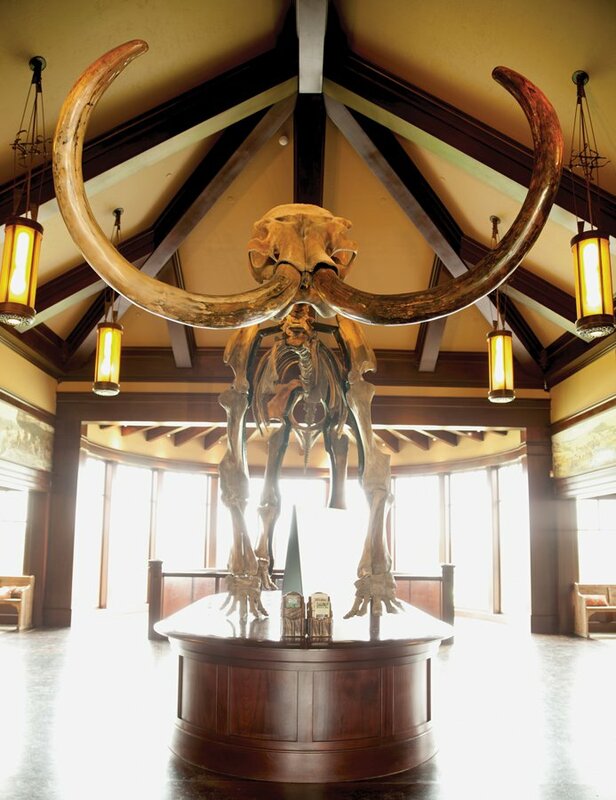 Created by artist Greg Congleton, the buffalo is nicknamed Chip and has become almost a mascot for the property. It contains a variety of fun objects, including a French fry machine in the posterior. “The artist jokes that while most buffalo make chips, this one makes French fries,” Jeanie says. If you’re looking to host a private function, you can rent the Osage Restaurant’s National Wild Turkey Federation (NWTF) room, which overlooks the golf course’s ninth hole. And here’s the super-fun part: You walk through a book case doorway to get in there! Once you’re inside, there’s another book case that opens to a secret door and stone staircase that walks you out to the ninth hole. 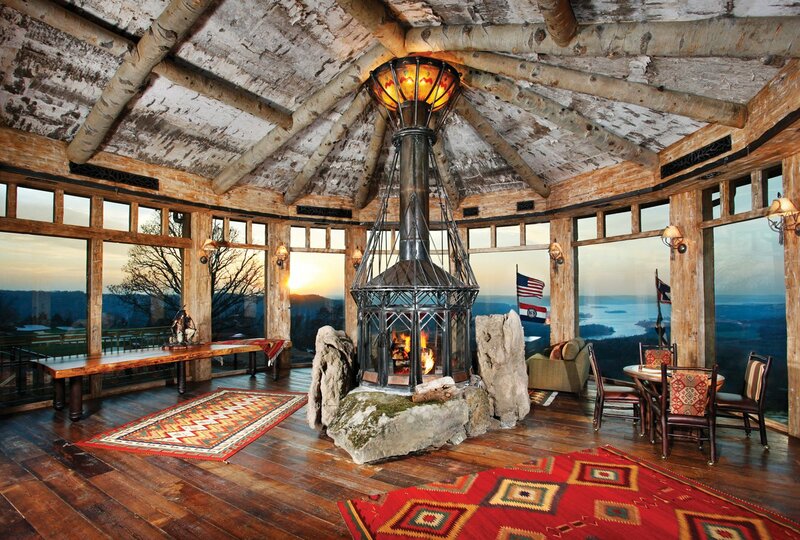 The Round Room in Osage Restaurant couples a cozy fireplace setting alongside a beautiful view of Table Rock Lake. 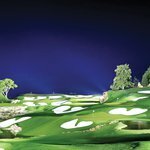 Arnold Palmer designed Top of the Rock’s driving range that features 16 target greens with synthetic and natural grass and water features. 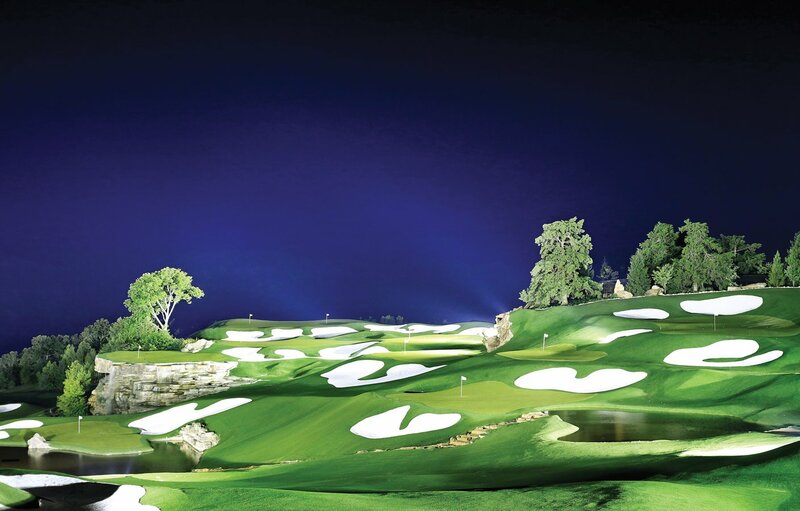 It is an extraordinary site any time of day, but the coolest part is that it’s fully lit and allows guests to golf until 10 p.m. Golfing at night? Yes please! 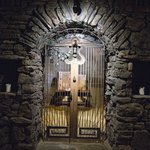 Arnie’s Barn is a 150-year-old barn that was moved to Top of the Rock from Arnold Palmer’s hometown in Latrobe, Pennsylvania. The barn was deconstructed, piece by piece, by a local Amish family. The pieces were numbered, and it was reassembled here in the Ozarks by local craftsmen. The structure houses a Mexican restaurant that features incredible views of the Arnold Palmer Driving Range, and it’s also home to the Top of the Rock Pro Shop. While you’re here, look over the bar to find a record-breaking Marlin that was caught by Jack Nicklaus on a rod and reel! 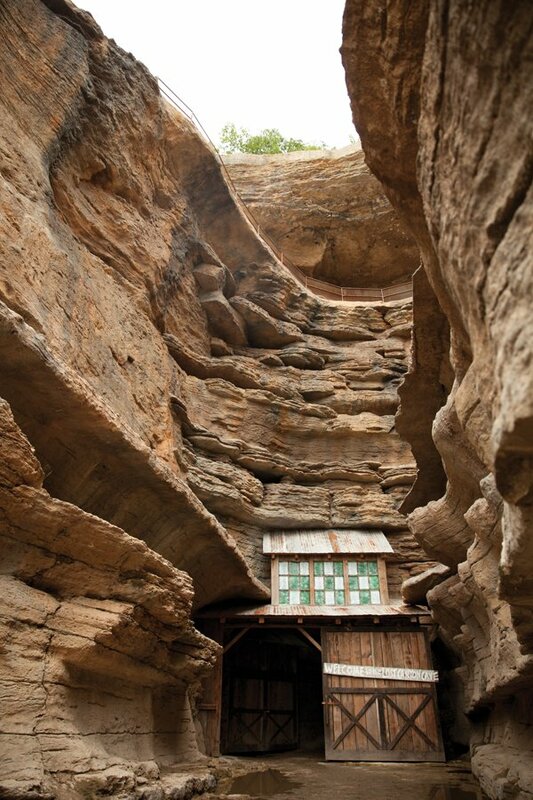 When visiting Top of the Rock, the journey through Lost Canyon Cave and Nature Trail is a must. 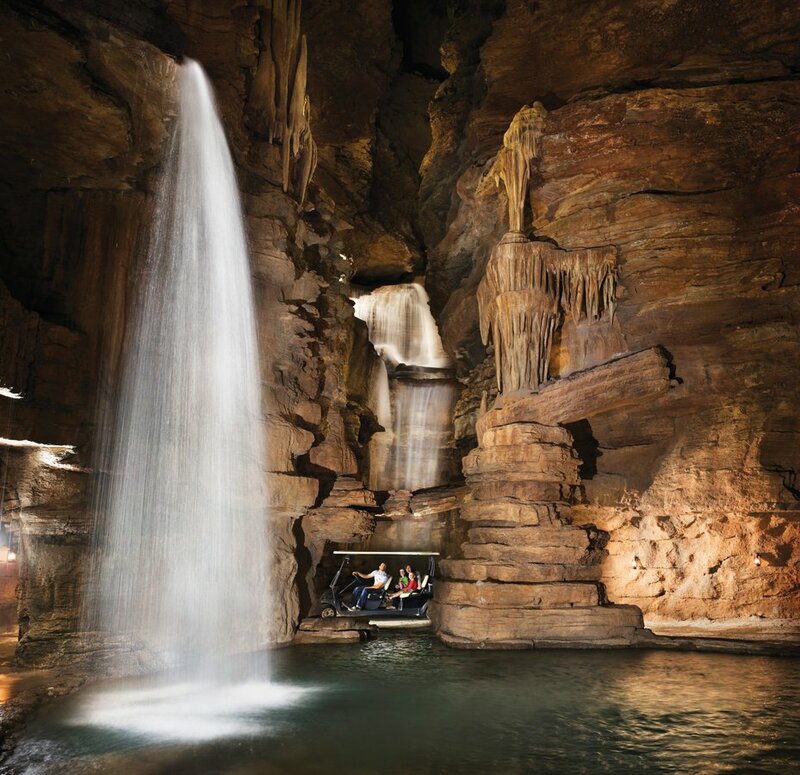 Visitors ride in an electric cart through the 2.5-mile trail, which offers a series of stunning natural rock formations, beautiful views of Table Rock Lake and the awe-inspiring Lost Canyon Cave. 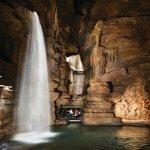 The centerpiece of the four-story cave is a cascading waterfall. Yes, it’s as awesome as it sounds. He’s so hands on, in fact, that he spent hundreds of enjoyable hours hiking and marking out the Lost Canyon Nature Trail to bring visitors into close contact with dramatic natural features. “He’d go out there with those little flags and fluorescent ties and mark which trees they could take out and where the trail would be,” Jeanie says. “He loves doing that stuff.” And to help capture the most scenic views possible, he also personally located each structure and approved every view from every window. “When he’s building something, they almost always do a mock up,” Jeanie says. “Then he goes out there and gets a forklift to get up and check the view from every opening and every window. He’s a nut about views.” He also approves all other decisions, small and large, on everything from the design to the décor. This desire to share these many artifacts, shows the true face of Johnny’s character: Jeanie says sharing is an underlying goal in everything he does. 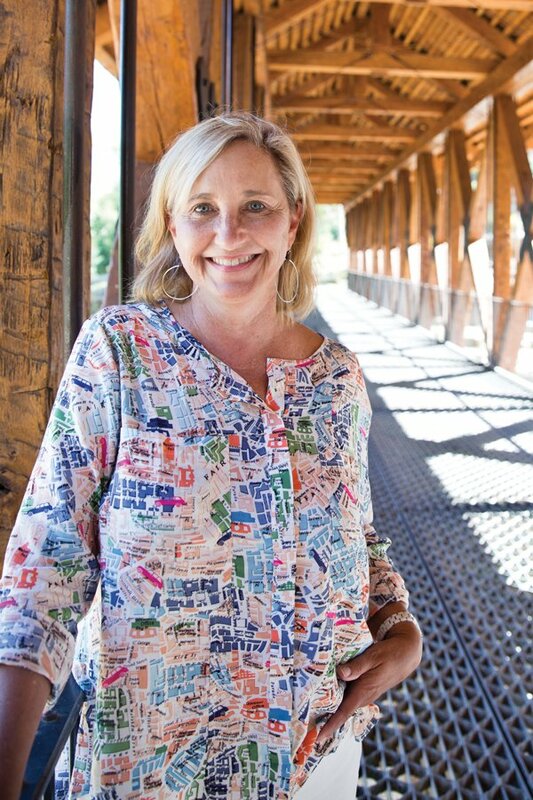 “People ask us, you know, ‘Why not just build your own retreat?’” Jeanie says. “Well, that’s not the way he works. He wants to share everything.” And perhaps the most charming part is that he’s quiet and humble, and he never wants to take any of the credit for himself.